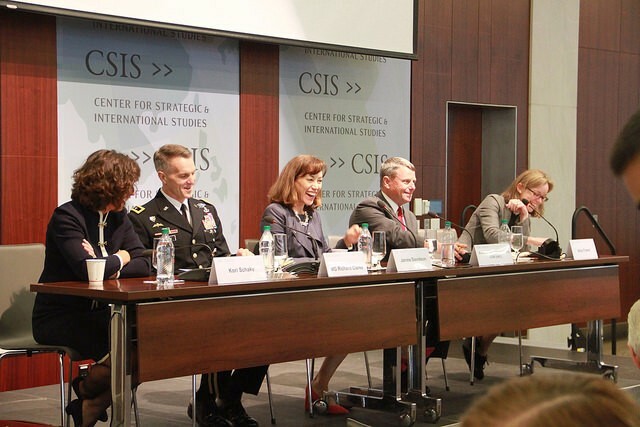 It is our pleasure to send you the May Edition of ISP Brief, the monthly newsletter of the CSIS International Security Program. ISP Brief features articles and commentary written by our scholars, their analysis as published in various media sources (including video and audio highlights), and links to recent events. We hope the newsletter provides you, our readers, a snapshot of the excellent work underway in ISP, and the engaging thoughts of our experts. As always, your feedback is welcome. Try out our new analytics tool to build and evaluate your own navy. Read the new report Defense Acquisition Trends 2016 and try out the defense acquisition analytics tools. "What to Expect in the FY 2018 Defense Budget"
"Overseas Contingency Operations Contracts after Iraq: Enabling Financial Management Research and Transparency through Contract Labeling"
By Andrew Hunter and Gregory Sanders. "Incentives in Performance-Based Logistics Contracting"
By Andrew Hunter and Jesse Ellman. "Measuring the Impact of Sequestration and the Defense Drawdown on the Industrial Base"
By Andrew Hunter, Gregory Sanders, and Rhys McCormick. READ "Countering Coercion in Maritime Asia: The Theory and Practice of Gray Zone Deterrence" by Michael Green, Kathleen Hicks, Zach Cooper, and John Schaus, CSIS. 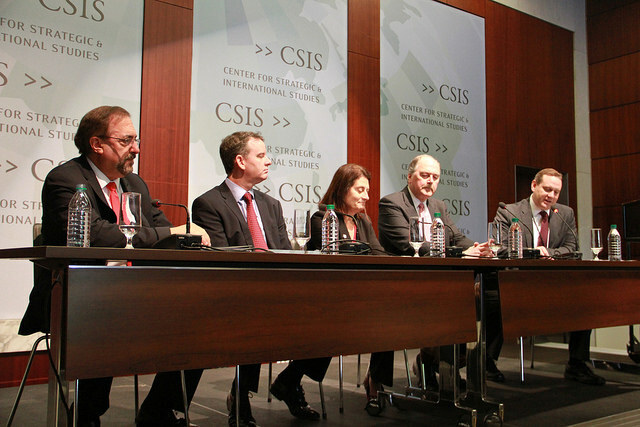 READ "Turkey Is Not an Easy Ally, But It’s Not Time to Write it Off" by Melissa Dalton and Samuel J. Brannen, CSIS. 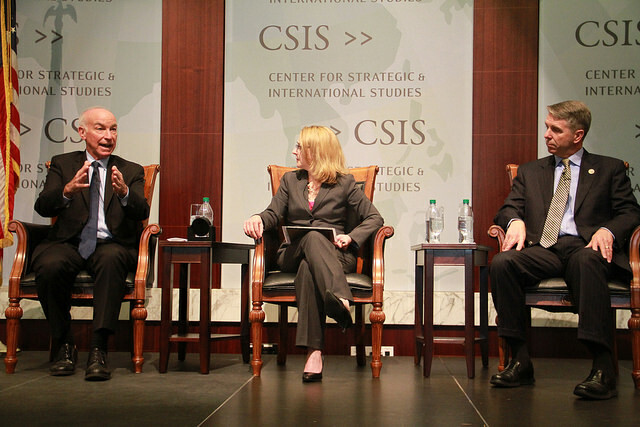 READ "Military Politicization" by Alice Hunt Friend, CSIS. READ "Developing an Effective Missile Defense" by Tom Karako, The Cipher Brief. READ "Trump’s Promised Big Boost To DoD Evaporates In 2018 Budget" by Mark Cancian, Breaking Defense. READ "Assessing the Navy’s Composition and Cost in a Time of Uncertainty" by John Schaus, CSIS. READ "A failure in discretion: the meaning of the Trump leak to the Russians" by Sharon Squassoni, Bulletin of the Atomic Scientists. READ "Doomed to repeat? How Syria could become Trump's Somalia" by Alice Hunt Friend and Melissa Dalton, The Hill. 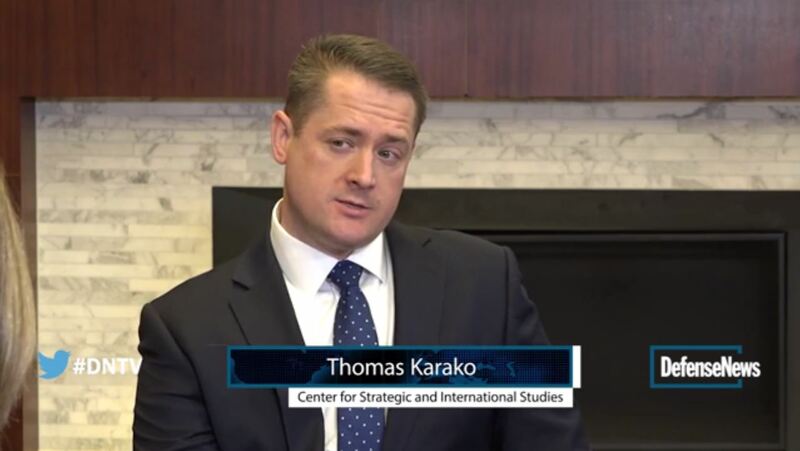 WATCH Tom Karako talk about the sweeping ballistic missile review's implications on Defense News. HEAR the new Smart Women, Smart Power podcast featuring two of India's top ten female entrepreneurs and how their startups are creating positive change. SEE Beverly Kirk moderate a panel at Council on Foreign Relations on the media's evolving role and how it should proceed to cover the Trump administration. LISTEN to Beverly Kirk interview PEN America's Executive Director, Suzanne Nossel, for the S mart Women, Smart Power podcast about her work defending free speech and persecuted writers worldwide. Meet North Korea's new intermediate-range ballistic missile, Hwasong-12 , then compare it to other North Korea Missile Launches 1984-Present . "To OMB, the decision isn’t about the specifics of the LCS program but about 'not wanting either Wisconsin or Alabama -- where the LCS’s are built and both Trump states - to suffer." - Mark Cancian quoted in Bloomberg Politics article "Suddenly There's Another Littoral Ship in Trump's Budget Plans" on May 26, 2017. 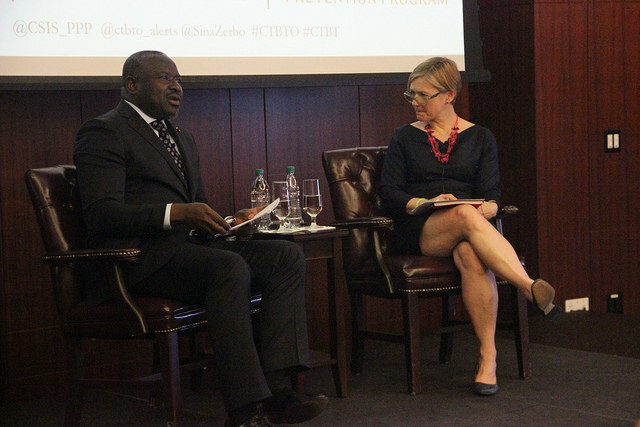 "We would like there to be better U.S. strategic thinking about that bigger picture. And then observing how it manifests in what seem to be small things that can be managed case by case. Once you do that it makes already complex problems in individual cases even more complex, and we think that’s good." 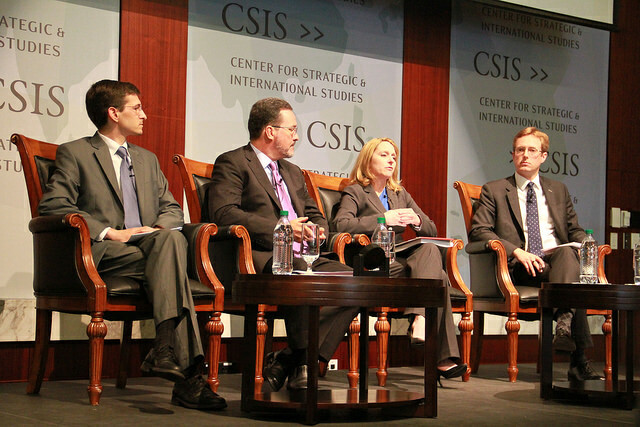 - Kathleen Hicks quoted in Seapower Magazine article "CSIS Officials Challenge U.S. to Clarify Commitment, Exercise Restraint in Maritime Asia" on May 25, 2017. "Tom Karako...noted that building out the missile defense space component has been a long-stated priority of the government. 'The last five administrations have…had it on paper as a critical element for long-range missile defense…[but] for whatever reason it continues to get pushed back.'" - Tom Karako cited in National Defense article "Pentagon Wants More Missile Defense Capabilities in Space" on May 25, 2017. "The fact that some FYDP data was released but OSD says it is subject to change means that the plans shown in the FYDP do not necessarily have the backing of the new administration. With that said, it is the best data available for understanding the future trajectory of specific programs so it is certain to be analyzed by Congress, industry, and others." - Todd Harrison cited in Defense News article "Why future years' defense numbers are so strange in the FY18 budget" on May 24, 2017. "What makes a Special Purpose Marine Air-Ground Task Force so valuable is the ability of the Marines to mix and match capabilities. That’s what they’re doing and that’s what they should be doing. And that’s particularly important for Syria because how the Marines were used dovetails with President Donald Trump’s foreign policy goals — defeat the Islamic State without putting too many boots on the ground." - Mark Cancian quoted in The San Diego Union Tribune article "Will missiles from Russia, China and Iran make amphibious Marines obsolete?" on May 24, 2017. "But his budget is only the ninth-largest defense budget increase in the past 40 years. Trump’s budget only increases spending by $19 billion over Obama’s 2016 request, whereas Trump promised an increase of $54 billion." - Todd Harrison cited in Vox article "Trump’s defense budget looks a lot like Obama’s defense budget" on May 24, 2017. "After the election, there was 'this euphoria” in the defense community that the “good times were coming back' under Trump. But a 'certain disillusionment, or more limited expectations, at least, have grown up in the last few months.'" - Mark Cancian quoted in The Cipher Brief article "Trump Defense Budget Falls Short of Promised Build-Up" on May 23, 2017. "Given the congressional budget process, Mr. Trump's budget request was effectively 'dead on arrival.'" - Todd Harrison referenced in Fox Business article "Trump's Military Budget is Seen as a Modest Step Beyond Obama's" on May 23, 2017. "When we provide security assistance to other countries we are essentially manipulating the monopoly on use of force of that other country and that is fundamentally a political act." - Melissa Dalton quoted in CBS News article "Trump budget advocates slashing weapons grants for U.S. allies" on May 22, 2017. "Just because a country holds elections doesn't mean it's a democracy. At the end of the day, it's the system led by the supreme leader who decides who is going to be the key candidates." - Melissa Dalton quoted in U.S. News article "Iran's Presidential Election: What You Need to Know" on May 19, 2017. "It’s not unusual for a U.S. president to call an ally after an important vote. But context matters, and there’s no doubt that U.S. allies and adversaries alike took note of the nature of President Trump’s call to President Erdogan following the referendum...it was interpreted by many observers as the U.S. president applauding President Erdogan’s consolidation of power. Calls from the U.S. president have strategic consequences." - Melissa Dalton quoted in Roll Call article "With Turkey’s Erdogan, Transactional Trump on Display" on May 17, 2017. "While Trump has said his proposal will be one of the largest increases in history, 'in seven of the past 40 years the budget increased by a larger amount year-over-year, and that is excluding war-related increases...What he should be bragging about instead is that his budget would exceed the peak of the Reagan buildup even when adjusted for inflation." - Todd Harrison quoted in Bloomberg Government article "Trump Pentagon budget adds ship, no planes, to Obama plan, officials say" on May 16, 2017. "Andrew Hunter...believes that the EO could lead other nations to adopt policies that require buying from their own domestic firms. 'A lot already have those…[but] it will encourage them to be even more aggressive. That is a concern for the defense industry. It definitely complicates the business case they put together for foreign military sales." - Andrew Hunter quoted in The National Law Review article "'Buy American' Executive Order Could Impact U.S. Foreign Military Sales" on May 15, 2017. "I would say Democrats broke that [principle] some time ago, because DoD has been putting about $30 billion in base budget funding into the OCO budget, in addition to all the base budget funding Congress put in OCO. I think that will continue as long as fiscal conservatives will tolerate it." - Todd Harrison quoted in Defense News article "Hawkish lawmakers frustrated by budget caps press for repeal" on May 15, 2017. "Fundamentally this is a problem with physics and engineering for them. They don't have to have outside help. This is something with trial and error; you can figure this out over time." - Todd Harrison quoted in CNBC article "Former CIA agent says Iran aiding North Korea as new missile test emboldens Pyongyang" on May 15, 2017. "The Pentagon and Navy are likely avoiding public statements because the president's order put them in a difficult position with few good options. I would guess it would be billions of dollars and years of effort [to replace the electromagnetic catapults]. So that is why you are hearing crickets because it is just not doable." - Mark Cancian quoted in Washington Examiner article "Pentagon, Navy aren't touching Trump's call to replace 'no good' launchers on aircraft carriers with 'goddamned steam' catapults" on May 12, 2017. "'The global arms market has changed where Saudi Arabia has explored other arms deals with U.S. competitors in Russia, China as well as Europe.' Also, Dalton said the disclosure of Saudi-Russia arms talks follows a strategy sometimes used by Riyadh: highlight alternative suppliers of weapons as a means of getting a better U.S. deal or even approval." - Melissa Dalton referenced in CNBC article "Russia tries to elbow its way into Saudi Arabia arms club" on May 6, 2017. "Thomas Karako noted that South Korea's sole THAAD battery does not quite have the range to cover the entire country. But he called it an important first step. 'This is not about a having a perfect shield, this is about buying time and thereby contributing to the overall credibility of deterrence.'" - Tom Karako cited in Daily Mail article "China demands halt to US missile shield in South Korea" on May 2, 2017. "The growth in earnings we’re seeing now is more of a reflection of how companies positioned themselves to handle the drawdown than anything else. So far, there has been no boost in defense spending from Trump, and given the budget politics in Washington, there is not likely to be a big increase anytime soon." - Todd Harrison quoted in The Hill article "Trump surge fades for military contractors" on May 2, 2017. "Based on his statements thus far...'it feels like he has a vision in that he wants the United States to be strong and respected and to do well. But on the question of how to make that happen, he just doesn’t seem to have a strong view or a set philosophy, unlike previous presidents.'" - Christine Wormuth quoted in Roll Call article "How Trump Became the Vacillator in Chief" on May 1, 2017. "What has been proposed is absolutely and completely unrealistic. The amount in (Trump’s) request is perfectly reasonable; it’s not much more than what Obama proposed. What is unrealistic is that it’s paid for by the non-defense budget." - Todd Harrison quoted in McClatchy article "Budget fight imperils Trump’s military spending demands" on May 1, 2017.